The announcement of Utah going D1 got us thinking about geography in lacrosse. Geography is important to Utah because they will become the western-most program in the U.S. That means they become the closest program to the fastest growing lacrosse regions in the country. 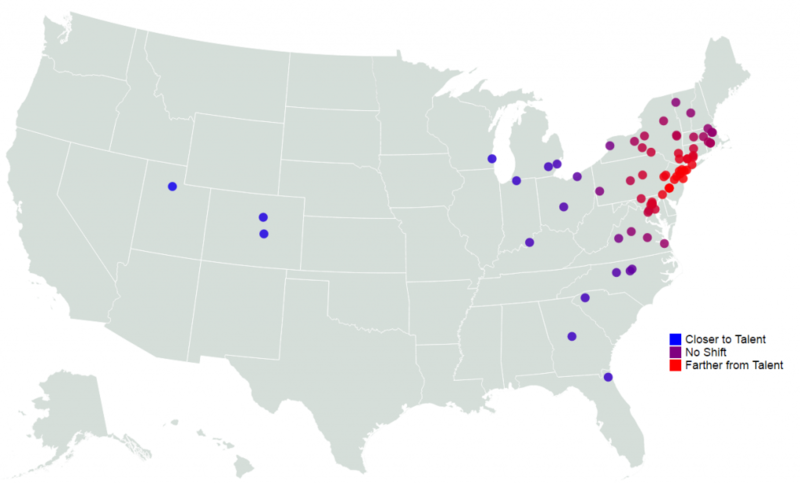 But they are also the farthest away from the traditional east coast hotbeds. I should rephrase. Geography may be important to Utah. If the hotbeds of lacrosse on the west coast continue producing players on their current trajectory, then having “home-field” advantage in recruiting could be an advantage for the Utes. Our ultimate goal is to understand how big a role proximity plays in the decision-making of a prospective D1 player. That will help gauge the true impact of location on Utah, or any program. To start, I wanted to take a better look at how the flow of players has affected each school. In previous articles, we’ve written about the fact that while the traditional hotbeds still send the most players to D1 rosters, the fastest growing areas are mostly out west and in the south. California, Washington and Colorado are all in the top 6 along with Minnesota, Georgia, and Massachusetts. That said, those numbers reflect the total number of players from each state. It doesn’t reflect the output of those players. And when you factor in the productivity of the players, the story becomes even better for the west coast schools. A bit of methodology before I share the data viz. When I say productivity, I’m talking about total plays. A play in this situation is anything that’s been recorded in the play book. It could be a shot, a turnover (forced or committed), a goal, a penalty, anything that gets recorded. We use play counts as a proxy for the contribution a player makes. You could also think about it as a proxy for playing time. It definitely understates the contribution of defensive players, but it’s the best proxy for playing time we have access to. The red dots represent an area of the country that generates a lot of players and productivity. The total productivity of an area decreases as the dots move from red to purple to blue to grey. Not surprisingly, the Mid-Atlantic and upstate NY are vying for the top spot. There are pockets of productivity in some of the larger cities (Detroit, Denver, SF, Los Angeles). But by and large, this is more or less what you’d expect to see from a sport that has deep roots in one part of the country. It’s clear that for all the growth of the sport outside of traditional areas, if you are trying to maximize the value of a recruiting dollar, you are heading to Maryland, New Jersey, and Upstate NY. Maybe you’d argue: sure, but it looks like there are some pockets in Arizona around Phoenix. Maybe if I can dominate that market, I can pick off all the best kids. The problem is that even if you could, you’d be getting less productivity than if you got 5% of the players from greater Baltimore. So if we look at this as a point-in-time analysis, things don’t look so promising for Utah. The state produced no on-field productivity in 2017 and the closest pocket is right in Denver/Air Force’s backyard. But as with so many things in the data sciences, it’s the trend that matters. And the trend is where it gets interesting for Utah. Once you know where productivity is coming from, you can calculate how well each D1 program is geographically situated. We calculate this with a fairly simple formula. We weight each player’s play-count by how close they are to a given school. A player that grew up 3 miles from Hopkins is going to count slightly more toward the Blue Jays “local talent” score than to Maryland’s. And that player will have almost no effect on Denver’s “local talent” score because they are from so far away. Weighting the contributions in this way allows us to see how closely each program is situated to the collective talent of the D1 landscape. If I were to show that map, it would look a lot like the map above except instead of a dot for any area that produces on-field contributions, we’d have a single dot for each D1 program. But the color distributions would be the same. Which is why we want to shift our focus from point-in-time to the trend. When you do that, you can see how the shifts in geographic distribution of talent affect each program. And that is where we start to see the potential good news in this story if you are Brian Holman. Each dot on this map represents one D1 men’s program. The farthest blue dot to the left is of course, a future D1 member, the Utah Utes. Farther east, I wouldn’t blame you for thinking that the majority of lacrosse programs are off exits on I-95. The color of the dots is how we are representing the trend in lacrosse talent. Blue dots mean that overall, the collective talent of D1 men’s lacrosse is from closer to that program now than in 2014. Red dots mean that collectively, the talent is from farther now away than in 2014. It’s clear that this trend hits northern Jersey/New York city the hardest. The programs that are benefitting the most are those outside of the DMV and the Northeast. There are two main takeaways. First, the talent seems to be spreading out rather than shifting in one direction. Take the Boston area for example. If the talent was only shifting south and west, then you’d expect Boston schools and NY schools to be similarly affected. But that is not what we see. Instead, the effect on schools like Brown, Harvard and Yale, while still negative, is not as damaging as St. John’s, the team with the greatest negative movement. 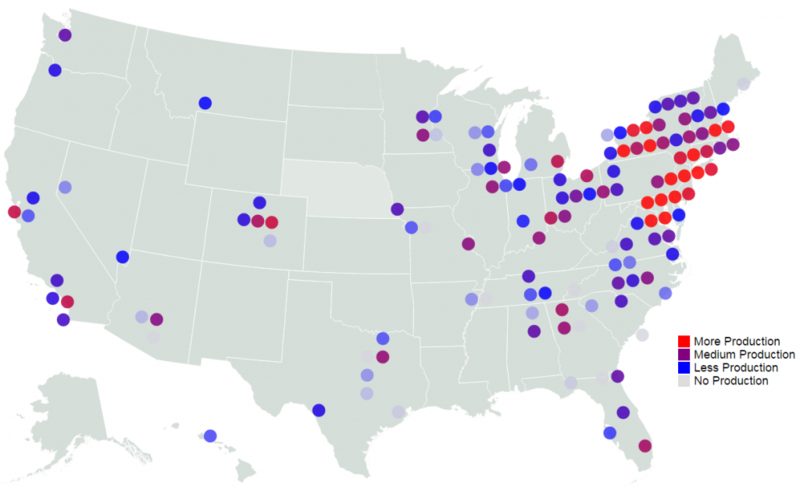 By and large, the talent pool is dispersing away from NY/NJ to pretty much everywhere. Even among this list, there is a huge discrepancy. In three years, the center of gravity for D1 production has moved .7 miles closer to Salt Lake City. I know that’s an unimpressive sounding number, but in the glacial timescale of people and talent, it’s huge. In contrast, for St. John’s, the team most adversely affected, the center of gravity is nearly 4 miles farther away than it was in 2014. Consider that numbers 5&6 on this list, Notre Dame and Jacksonville, are actually farther from the collective talent than they were 3 years ago (i.e. they have negative scores). But the shift was small, so they would still be considered better off than the other 65 D1 teams. There is interesting social science research on the concept of tailwinds (and our ability to acknowledge their role in our success). Tailwinds in this context are the small advantages that we enjoy which contribute to our accomplishments. People tend to be more aware of obstacles they’ve overcome than the advantages that they’ve had. It’s an inherent human bias (according to researchers). Since I know you love how we mix lacrosse science with other scientific disciplines, I was very excited to make the analogy here. East coast programs have enjoyed this tailwind for the last…forever. The fact that you can fill a roster without having to hop on a plane to recruit far afield is a tailwind. It means you have more room to allocate precious resources in other areas. It reduces the likelihood that university administration is breathing down your neck about program costs. It’s an disadvantage that western programs have had to overcome, but our analysis shows that the tailwind/headwind is losing steam. You could reasonably make the argument that even if the trend is in their favor, Utah is still going to be the farthest school away from the majority of D1-worthy high school talent. And that is true, barring a real explosion from the fastest growing lacrosse regions. But even if that is the case, the advantage that the east coast schools have enjoyed is diminishing. And we like to take the long view. Over time, that can only be a good thing for Utah. This analysis was mostly about setting a baseline. Where was the talent? Where is the talent? How has it shifted. If you’ve followed the growth of the game, you probably aren’t surprised by these findings. Hopefully you liked the maps. Where it gets interesting is if we can pair this baseline data with better insights about how geography affects the crucial decision: where should I play college lacrosse? It is entirely possible that even though the talent pool is spreading out, program pedigree trumps all when filling out a roster. If that is the case, then the good geographic trends probably won’t mean much for Utah. That is ultimately the question we are trying to answer here: does geography help or hurt the new program? Next step will be to create a model that tries to quantify the impact of player and program in that decision. Until then, enjoy the pretty colors. Thank you so much for even considering us in your analysis truly enjoy the the thought provoking nature of your articles. More importantly love the detailed analytical analysis of the actual teams have been a fan for some time of the analytic process and so intriguing to see how it pertains to our world! Keep up the great work and Go Utes!! Thanks for the feedback Coach! We’re honored that you’ve been spending a little time in our small corner of the lacrosse world. Glad to hear that you are a stat-head too. I’m sure that will serve you and the Utes well in the coming years. Good luck preparing for next season. We are looking forward to having Utes game officially in our stats in 2019!